For years I’ve heard friends tell me that they are waiting for solar to get cheaper before they lease or purchase them. Even as prices have dropped to a small fraction of their prior cost, there is an assumption that they will get only cheaper over time. The reality is that the panels are now only a small fraction of the total cost of having them installed. For example, panels can be as cheap as $ .50/watt (wholesale) and (as of 2014) cost an average of $4.72 installed. The price of solar panels may continue to fall but the cost of labor likely won’t. Even more important is the fact that the current 30% federal tax credit expires next year. What does that mean? Well, for starters it means that the cost of Solar is actually going to increase significantly! For those who have an electric bill of around $100/month (annualized average) you will save money by installing solar. If your usage is lower than that and you think you are likely to purchase an electric car in the next few years or to switch some appliances to electric that now run on gas (e.g. we switched from a gas water heater to a heat pump one) then the solar will definitely make economic sense. Most likely the price will be a lot higher at the end of next year than it is now and paying 30% more for solar (assuming you qualified for the tax credit) is no small amount. The good news is that our solar provider, @Sungevity is offering $1,000 off using a referral code and you can use ours with this link: http://www.sungevity.com/get-your-iquote…. They offer this discount a couple of times or so a year and it’s the biggest discount they offer! We do benefit from the referral — so if you do get a quote from Sungevity we would very much appreciate your using it. The most important thing is getting solar so if you prefer another vendor by all means get a quote from them too! If you have any questions about monthly leases vs pre-paid leases vs purchasing I’d be happy to address them, I’m very knowledgable about them after doing our research! With my Fiat 500e set to arrive imminently I spent time over the past few weeks evaluating the current EVSEs. These are common referred to as chargers, but the charger is actually located in the car (for Level 1 and Level 2) and the device installed on an interior or exterior wall or mounted on a pedestal is actually a fancy safety device that makes sure power is shut off automatically if the connection is broken, preventing the risk of voltage arcing as one pulls the connector out of the socket. This is really important as 240volts is able to jump rather far and the arc could be dangerous and even lethal. 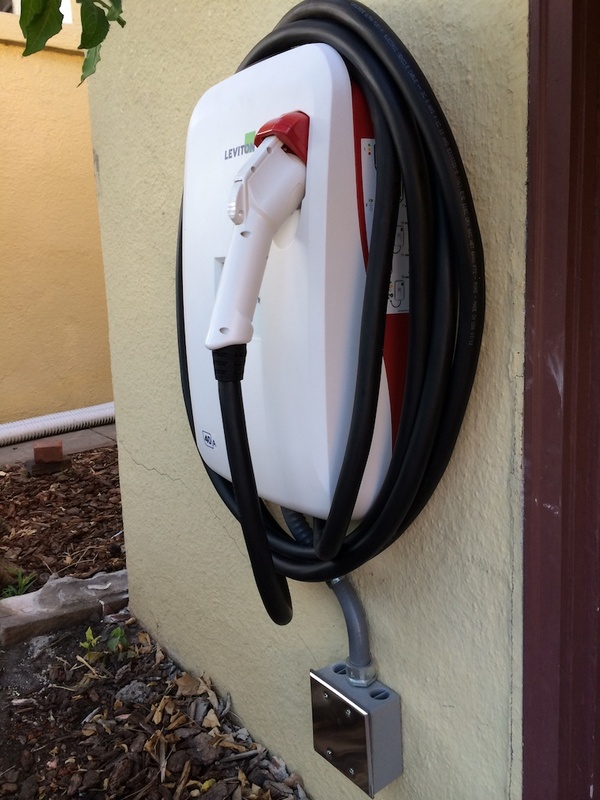 Current EVSE’s range from 16 amps to 40 amps in the amount of power they can deliver. Most current level 2 devices are rated for a maximum charging current of 30 amps. Cars also have a maximum rate at which they can charge with most newer ones charging at a maximum of 32 amps (a little over six percent faster than 30). A few cars such as the Tesla Model S and the Toyota Rav 4 EV can accept current at 40 amps. I focused my choices on the EVSEs that were 30 amps and above with a preference for 32 and 40 amp units. The factors I ultimately considered included: Power output, price, warranty, aesthetics and availability. Most companies limit the warranty to just one year if you have someone other than one of their certified professionals install it. This seems silly to me as these “professionals” tend to charge a huge surcharge over what the cost for an electrician would charge for the amount of work. For example, purchasing a basic Aeroenvironment charger that sells for $899 online, from the Fiat dealer with installation included would add $1,100 to the price! Ultimately after considering all of the major brands, I settled on Leviton, a name with a good and long reputation, who unlike Aeroenvironment isn’t in the military business. Leviton also offers 32 amp and 40 amp devices and offers a three year warranty when you self-install (or have your electrician install it). I preferred both the aesthetics and “future-proofing” offered by their 40 amp system and purchased it online from Amazon. It was delivered in two days with free shipping on a rather heavy unit! My electrician charged me less than $400 for the installation and the City of Berkeley charged me around $120 for the legally required permit. The total cost was thus around $1,700 for a much better device. If I had gone with a cheaper 30 amp from Bosch which sells for just $593 and would not have required the expensive six gauge copper the 50 amp circuit supplying the Leviton does. The actual cost would have been closer to $1,100 saving $900 over the Fiat recommended solution. Here’s my new level 2 charger, made by Leviton and delivering 40 amps at 240 volts! Fiat offers a new color combo for the 500e! I just found out today that Fiat has responded to customer demand and is going to be offering the color combo some of us wanted all along! They will now offer the black interior option, complete with orange striping along with the electric orange exterior color. For those who weren’t excited about having to try to keep a white interior clean, this is great news! This information is courtesy of McKevitt Fiat in Berkeley, CA who called me today to ask me my final color choice for my Fiat 500e which should arrive in 4-6 weeks! the timing is hard to predict as they are still arriving on a rather haphazard schedule as Fiat struggles to meet the far great than expected demand for there first electric vehicle. The only remaining mystery is whether or not the front fascia will be colored orange or white. It usually is colored to match the cars interior color but based on one sample my dealer has seen, it is likely to be white rather than black. This maybe due to the fact that orange cars were all planned with white interiors in mind. Hopefully this will have changed by the time I receive my car as the black and orange contrast is striking! Last Days for Big Discount on Solar! Earlier this year, I was lucky enough to sign up for solar when Sungevity was having one of its biggest promotions of the year. The install went well and my system is working great. They are having another big promotion now, six months later. The catch is this promotion is only good to the end of this month which is just a few short days! Here’s a link which includes a code that offers $1,000 back if you request a free quote before the end of this month. After the 31st the discount drops down to $500 still a nice discount. If you end up getting solar with Sungevity, please come back and comment to let me know! Energy Efficient Vinyl Windows — An Environmental Hazard to Avoid! Along with our solar project we’ve been working with a local contractor on energy efficiency improvements to our nearly 100 year old home. Our windows are original and let in lots of heat when the sun beats down on them which can be very uncomfortable in the summer and they are quite drafty and cold to the touch in the winter. My ideal option would be to replace the existing glass in the windows with dual pane insulated glass and add weather-stripping to improve them. Unfortunately its not feasible to replace the glass given the amount of labor involved and the additional thickness of the dual pane windows. It’s also dangerous and toxic to try to refinish the windows given the layers of lead paint that were put on them before lead was outlawed as an additive. The cheapest and perhaps most popular option is vinyl-clad windows. They are now available in different colors but you are stuck with what you get and deciding to paint the house differently in the future will make those windows stand out like a sore thumb. Most available and popular are vinyl windows with white sashes and one can see them in homes throughout the bay area and I imagine across the country. In older homes they can stand out like a “sore thumb.” Even worse is that vinyl is PVC (poly vinyl chloride), a substance that has gotten lots of press over recent years for the way it out-gases toxic fumes. We try to avoid products made of it for our health and that of our 2 1/2 year old. My fears were confirmed by articles I read online such as this one from ehow.com and this online discussion on a green building website. I also learned about composite windows that have some unknowns for their durability and the risk of different contractions/expansions with temperature changes of the composite materials. These include aluminum/wood clad windows as well as ones made in part with fiberglass. Overtime as they age it’s possible for water to get trapped between the composite materials causing rot of the wood. With either these windows or vinyl ones, it’s likely they will need to be replaced in the future and will end up in landfill where they will long outlast our lifetimes and many that follow. Ultimately, the best option for us was to stick with wood windows. They do require more maintenance most of which is simply painting them every few years, less frequently perhaps for ones that are in the shade and more frequently for the ones that have direct sun exposure. The downside of switching to new wood windows is that they are created from new growth wood which isn’t as strong as the old growth wood used to create the original windows that were most likely made from redwood. In my opinion the benefits of getting windows that are well insulated, open and close smoothly and don’t have any lead paint on them, outweighs the negatives of needing more TLC and of course the cost involved. I’ll follow this up with a full report once our new windows, most of which are Marvin Tilt-packs, are installed. I’ll also be writing some follow-up articles about the other improvements we are making including insulation, air sealing, and more.